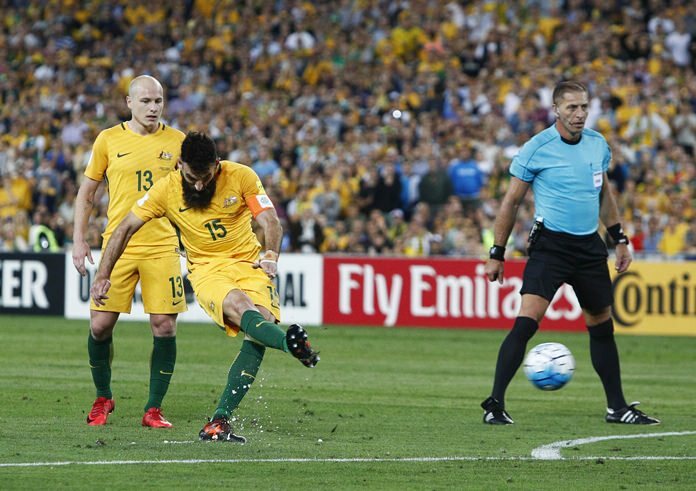 Sydney (AP) — Mile Jedinak stepped up when it counted most, propelling Australia into next year’s World Cup with a hat trick Wednesday in a 3-1 victory over Honduras that secured the next-to-last spot in Russia. The Australian captain was in doubt for the intercontinental playoff series with a groin injury that had forced him to miss the end of the Asian qualifying campaign, when the Socceroos narrowly missed out on direct entry. But Jedinak played a full game in the 0-0 draw in San Pedro Sula last Friday and, aided by the state-of-the-art rehabilitation program on Australia’s charter flight home, took the free kick that broke the scoring drought in the 54th minute at Sydney’s Olympic stadium. His free kick curled to the left of the wall and deflected sharply in off defender Henry Figueroa, bringing the parochial 77,060-strong crowd at Sydney’s Olympic stadium to life. He converted from the spot in the 72nd after referee Nestor Pitana penalized Bryan Acosta for a hand ball and again calmly slotted home another penalty in the 85th after Robbie Kruse was dragged down in the area. After 22 games and 27 months, the win ensured Asian Cup champions Australia qualified for their fourth consecutive World Cup. The result meant Asia got a full quota of five teams into the World Cup in Russia, with 31 of the 32 places decided. Peru were hosting New Zealand to determine the last qualifier later Wednesday.